In the Latino culture, mothers are the symbol of unconditional love. The one who protects when we need shelter and the one who provides when we need food or clothing. Yes, fathers do this too, but not at the level mothers do. When a mother sends their child to school, thereʼs a clear expectation the child will return that afternoon. But, when a mother sends their child to war...It only stands to reason that the pain and void of not seeing their child return cannot be filled with a letter explaining how valiantly they died for their country. This was the case for numerous Mexican American mothers who decided to fill that void by building a memorial in honor of their sons who died in World War II (WWII.) These mothers organized themselves right after WWII and formed a group called “La Sociedad de Madres” (Mothers Society) and embarked on an effort to build a veterans memorial to honor their children. In 1948, La Sociedad de Madres found a carved statue of a soldier that cost $4,000 to purchase and ship it from Italy. The amount was challenging for the time period, but the members of the group were up for the challenge. 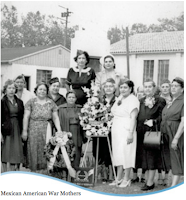 Hosting and preparing a series of fundraisers (tamale sales), La Sociedad de Madres reached their goal and on May 10, 1951 (Mexican Motherʼs Day) the monument was dedicated. 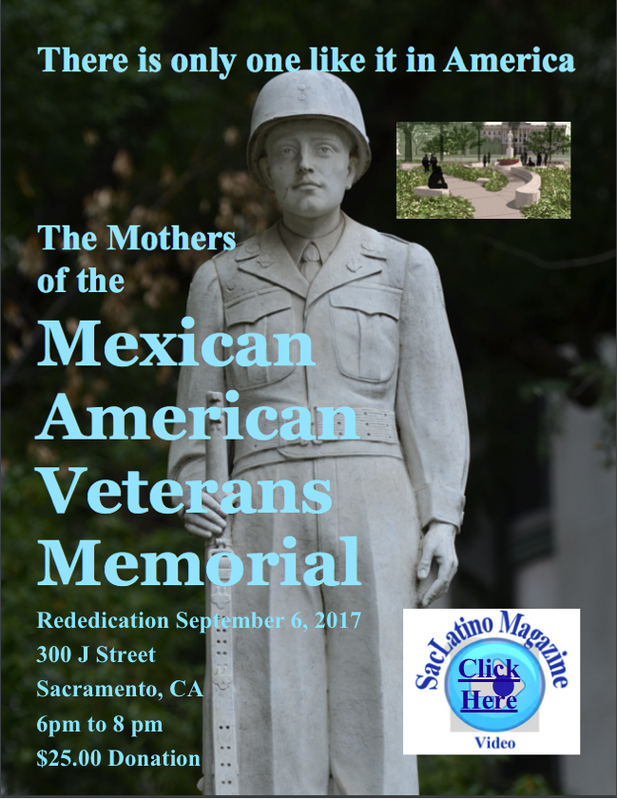 The Memorial was initially located on the grounds of the Mexican American Center, a nonprofit that offered social services to primarily Mexican American residents of Sacramento. 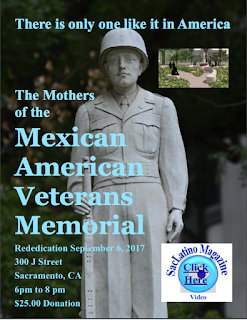 Since WWII, there were the Korean and Vietnam conflicts, where more soldiers died and so a push was launched to relocate the Memorial onto state property to better honor all Mexican American/Latino soldiers who died in battle. The push was successful and the memorial was moved to its present location on the grounds of the State Treasurers building, facing the westside of the state Capitol. Its rededication was held on September 16, 1975, which is also independence day in Mexico and several other Latin American countries. At the time of its move and rededication, little consideration was given to its design regarding it being “visitor friendly” and a place for visitors to share a moment. Plus, as other memorial monuments were built around the Capital grounds it became evident the Memorial needed an upgrade. the Memorial. They soon learned that the State of California would not fund a renovation, and that only private funds could be used. They worked toward raising money and their efforts included an artist rendering of what a renovated Memorial would look like. The artist rendition was the illustrated work of world renowned muralist and Vietnam Veteran Juanishi Orozco. Although the private efforts were admirable, they fell short, and the group decided to work with the Department of Veterans Affairs and several members of the State Legislature to obtain public support. 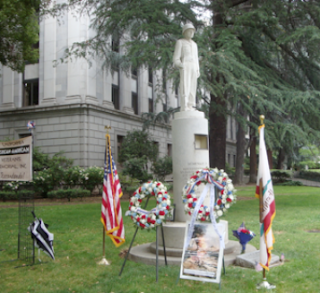 In 2007, the State Legislature created the Mexican American Veterans' Memorial Beautification and Enhancement Committee to beautify and enhance the existing memorial, and to secure private funding to complete the project. The estimated cost of the memorial restoration project was $1.1 million. The Memorial ʼs design, engineering services, architectural drawings, and environmental assessment work was completed with the initial $335,000 raised. However, the most expensive component has been the actual renovation, which the Memorial Committee estimates will cost over $800,000. A series of fundraisers were held throughout the state with the assistance of the Cesar E. Chavez chapter of the American GI Forum.